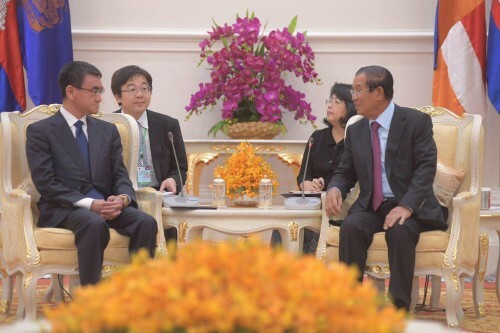 The meeting between Prime Minister Hun Sen and Foreign Minister of Japan Taro Kono on Sunday afternoon at the Peace Palace did not discuss any political issues; rather, the discussion focuses on strengthening further cooperation, particularly Japan’s assistance for Cambodia. Japanese Foreign Minister Taro Kono pointed out that Japan has highlighted Japan’s goal of helping Cambodia to become a high middle-income country by 2030, according Eang Sophalleth, personal secretary to Prime Minister Hun Sen. He added that Japan is interested in assisting Cambodia with logistics sector, electricity, ports and vessels management, special economic zones, human resource development, and peacekeeping mission under the umbrella of the United Nations. The foreign minister also invited the premier to attend the Japan-Mekong meeting in the coming Fall. During Japanese Foreign Minister’s one-day visit, the two sides also signed exchange of notes and a record of discussions on Japan government’s financing to Cambodia government, including Japanese grant aid amounting to approximately $5 million for the implementation of the Cambodia Socio-Economic Development Plan and Japanese concessional loan with a total of approximately $90 million to implement project of expanding the transmission and distribution system in Phnom Penh phase II.